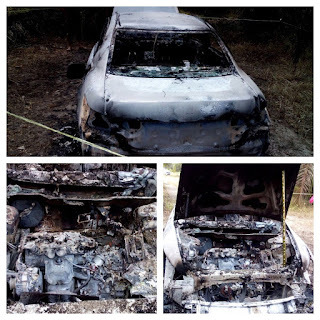 HUTAN MELINTANG: A burnt car was found near the palm oil plantation at Kampung Sungai Samak here this morning, two days after deputy public prosecutor Kevin Anthony Morais went missing. Hilir Perak district police chief, ACP Mohd Shuhaily Mohd Zain said the vehicle was discovered by members of the public around 10am. "They then contacted the police," he toldAstro AWANI. He said based on the physical characteristics, the car looked like a Honda Accord but the identification process, as well as on the car's chassis number is still ongoing. On the possibility that the car might have belonged to Morais, a former Malaysia Anti Corruption Commission (MACC) deputy director of prosecution who is now with the Attorney-General's Chambers (AGC), Mohd Shuhaily said investigations were ongoing on this. "Due to the impact of the fire, the vehicle was completely charred and forensics couldn't identify the chassis number. So we are still trying to find other ways to identify the vehicle," he said.